When you imagine a hackathon hack, what do you think of? Something cool. something new, using something in a way it wasn't meant before? Then our project is the definition of a hackathon project. We reverse engineered GM's cars, found hidden APIs (both public documented calls and private internal ones), and made modifications to the devices. We saw the incredible possibilities of GM's car dashboards and their API and decided we wanted to make something awesome! When looking at the documentation for the car we found there was no way to record audio, but we could play it back via TTS. However, after looking through the source code on the device and reverse engineering it we found an undocumented API call! We used Amazon Alexa Voice Service and GM's helpful API to create put Alexa on the dashboard of GM cars! Oh, there were plenty of challenges. Since GM's dashboard and API are still in development there were bugs, thankfully the GM representatives were incredible and did everything they could to help, even fixing bugs on the spot! We're all proud of every step of our project. I am especially proud when we discovered all of the hidden undocumented API features including app information, adding and removing apps, and recording audio. Everyone on the team learned a lot, I, Tristan, learned more about systems, hardware, and general back end architecture. Ian learned not to trust undocumented hidden APIs as they may not work completely ;). Zade learned what a pain it is sometimes to deploy projects. 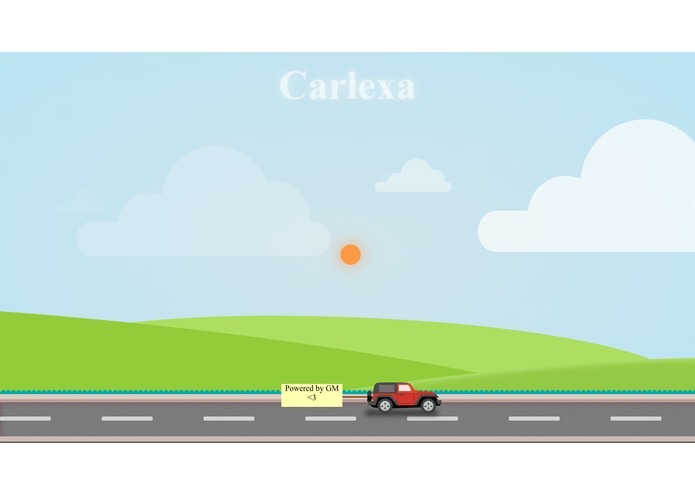 As GM opens up their platform to developers and allows more people to create car apps we believe that Carlexa can make it's way to GM vehicles!